It’s been quite a week here in Jerusalem, as the U.S. Embassy in Israel was officially moved from Tel Aviv to Jerusalem in an unforgettable joint U.S.-Israel ceremony on May 14th — the seventieth anniversary of the nation of Israel’s 1948 independence. It is important to remember that while the U.S. formally acknowledged Jerusalem as Israel’s capital way back in 1995, over the past twenty-plus years since then no president stepped forward to actually move the embassy to Jerusalem. It took President Donald Trump, following through on one of his most high-profile campaign promises, to seal the deal and declare that the U.S. will stand in solidarity with Israel as an independent nation and the lone light of liberty in the Middle East. 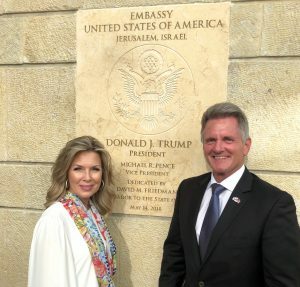 Matt and Laurie Crouch at the entrance to the new U.S. Embassy in Jerusalem. As we watched the ceremony and rejoiced with those assembled, I could not help but think of my dear parents, TBN founders Paul and Jan Crouch, and of the forty-plus years they stood strong in prayer and action for Israel. From introducing thousands of individuals to the land of Israel through the scores of Holy Land tours they hosted, to meeting and praying with nearly every Israeli prime minister over the past forty years, to establishing a production studio creating life-changing programming right in the heart of Jerusalem – my mom and dad modeled a tenacious faith in God’s promise that He would bless those who bless His people Israel (Genesis 12:3). Below is a short clip of Pastor Hagee concluding the historic dedication ceremony at the new U.S. Embassy in Jerusalem with a powerful prayer of benediction over the nation of Israel. As you take a moment to view it, please join Laurie and me — along with countless other believers around the world — in praying for the peace of Jerusalem (Psalm 122:6), and for God’s continued hand of blessing and favor upon this nation and people He has called His own.